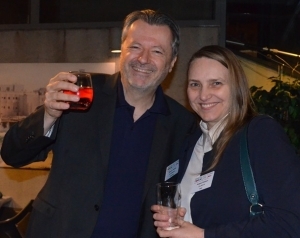 This year’s Mineral Recycling Forum 2019 took place in the lovely city of Kraków, south Poland, where international delegates from across the supply chain of industrial mineral recycling gathered to network and listen to an expert panel of speakers. The Welcome Reception at the Malecon Restaurant provided excellent views across the Vistula and of nearby Wawel Castle. Well thought and linked programme, relevant topics covered, smooth and well organised. Excellent programme; time to connect between sessions is really valuable, the longer breaks are good! Well organised event and good content, interesting overall forum for our area. Well done! The app is a great start. In his opening introduction, Mike O’Driscoll, Director, IMFORMED placed recycling into the context of the industrial mineral supply chain of the 21st Century, and reminded that prevailing issues such as overreliance on imports from certain sources and the continuing squeeze on Chinese mineral supply was helping to boost mineral recycling awareness and activity. The big picture on the raw material recycling sector from the European Commission’s viewpoint was ably presented in “Competitive manufacturing industries in Europe: circular economy and access to raw materials” by Maria Nyberg, Policy Officer, European Commission, Directorate-General for Internal Market, Industry, Entrepreneurship and SMEs , C.2 Resource Efficiency and Raw Materials, Belgium. Nyberg took us through the state of play on EU policy highlighting the Raw Materials Initiative (RMI), European Innovation Partnership Raw Materials (EIP Raw Materials), and H2020/Horizon Europe. Nyberg reported on the main findings on the EC’s recent “Report on Critical Raw Materials & the Circular Economy” concluding that “circularity” depends on recycling infrastructure, market prices of materials, the possibility to disassemble products, and the amount of material becoming available from products reaching their end-of-life. “Only a small fraction of CRMs remains inside Europe’s socio-economic system through functional recycling.” said Nyberg. In Davos in January 2019, the EC was recognised by the World Economic Forum as a champion of the Circular Economy, and bestowed upon it the 2019 Circular Economy Prize. But Nyberg concluded that more effort was required in closer alignment of industrial strategy, coverage of more sectors, empowerment of consumers, support of innovations, and to bring circular economy and carbon-neutrality policies together. “Recycling as a way of developing new business models for the minerals sector: regulatory bottlenecks and opportunities” by Francesca Girardi, Industrial Affairs Advisor, IMA-Europe, Belgium, underlined the significant demand for industrial minerals vital for a range of manufacturing industries in Europe. 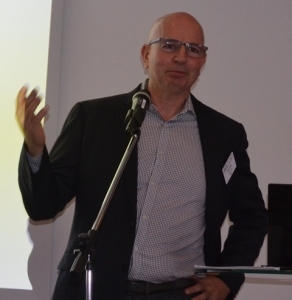 Girardi explained circular economy package implications for the industrial minerals sector and that innovative projects from the industry have been developed to reach more sustainable business models. In many cases closing the loop at each stage of the chain is technically, economically and environmentally not possible, eg. talc in autoplastics, kaolin in ceramics, borates in special glasses. However, although the minerals may not be recyclable per se, many of them live second, third, fourth or even an infinite number of lives thanks to the recycling of the applications they are used in. 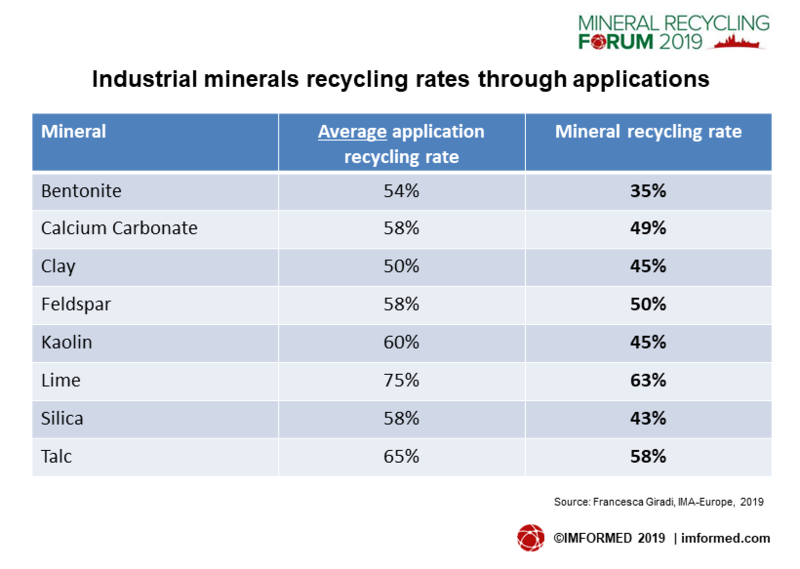 ““Despite the extensive recycling of multiple markets and its continuous improvements over time, there is still a need for more than 50% of primary industrial minerals to be produced to meet the growing market’s demand.” warned Girardi. 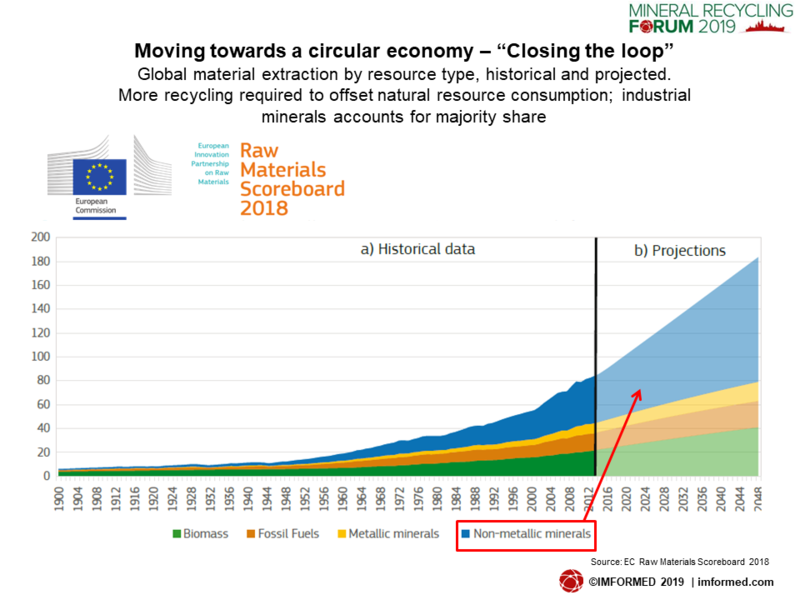 Several circular business models were described for the industrial minerals sector although Girardi also pointed out bottlenecks including a lack of harmonisation in the interpretation of EU legislation, and a lack of incentives to promote the transition to circular business models. 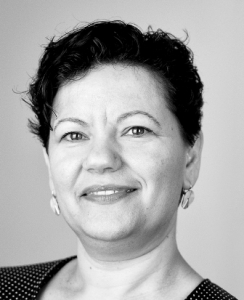 “Exchange between industry and policy makers is paramount” said Girardi. 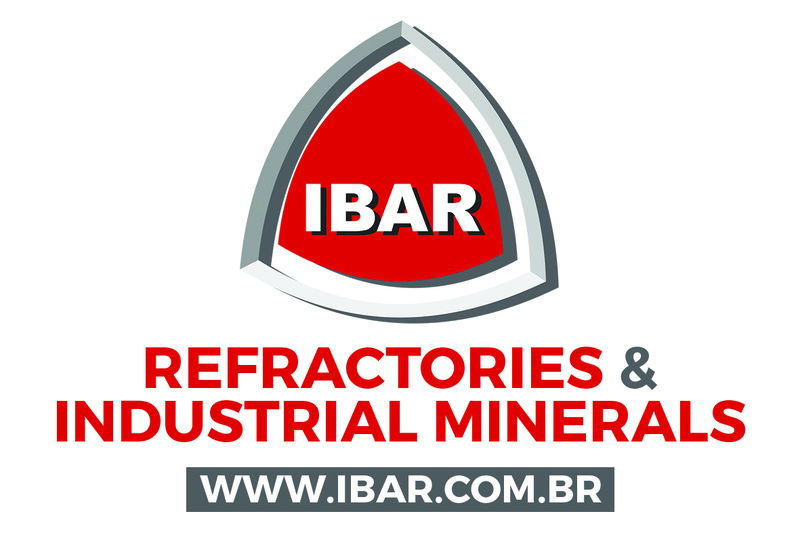 Where is the industrial minerals industry heading and why? “Strategy for companies aiming to participate in mineral recycling and the Circular Economy” by Bart Mantels, Program Manager Sustainable Materials Management, VITO NV, Belgium, compared classical and circular economy recycling processes using steel slag as a case study example. Mantels stressed that we need to find ways to: evaluate the economic and environmental sustainability of recycling primary raw materials; develop new metal recycling technologies with high efficiency and specificity; and new technologies to valorise the remaining matrix materials. “In a circular economy it can pay off to aim for higher quality recycled materials. 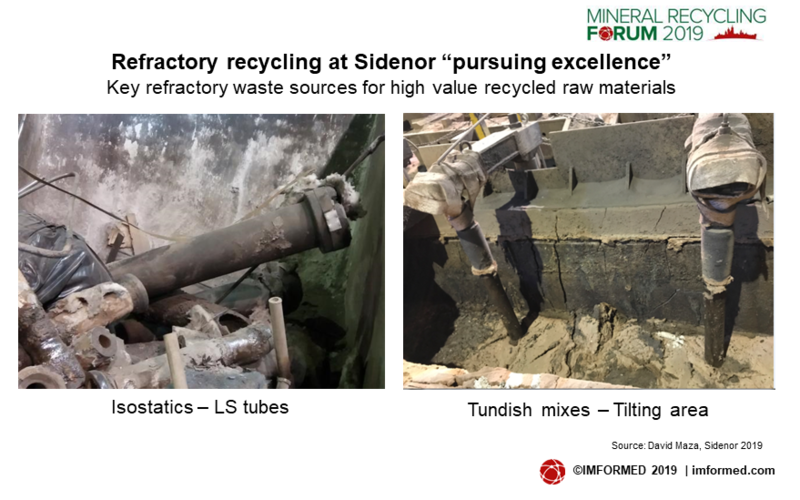 Higher purity of metals can offset higher recycling costs, and high quality matrix materials allow for higher value reuse.” said Mantels. In “Decoupling geology from geography: connecting market and minerals with hydrometallurgical processing of waste”, Mark Tilley, Vice President Business Development, Lixivia Inc., USA, proposed a new technology that enables local and regional stakeholders to utilise waste or low-grade minerals to produce high quality commodities. The method is by using Lixivia’s proprietary water-based Selex™ process which separates metals from minerals. 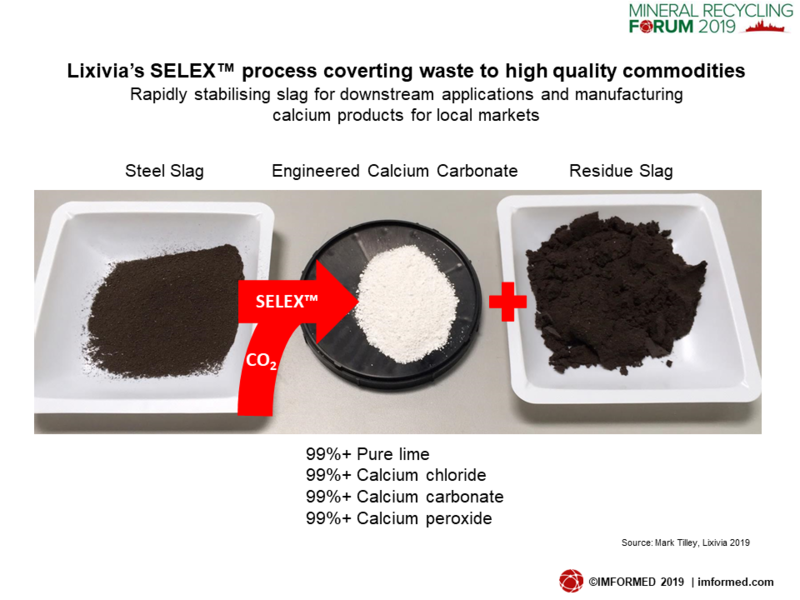 Tilley demonstrated how steel slag could be “rapidly stabilised” for downstream applications and yield a range of calcium products for local markets, ie. lime, calcium chloride, calcium carbonate, and calcium peroxide. Lixivia has a pilot plant for the process, and has had its calcium carbonate tested positively with a large US paint manufacturer. “We have full control over purity, crystal types, habits and dispersity.” said Tilley. Another interesting example was the “tuning” of dolime, from an off-specification dolomite, via calcination and the SELEX™ process to tune the Mg composition up to the customer’s grade dolime specification, at the same time yielding a magnesia product. “Close cooperation between technology providers and mining/processing enterprises is probably the best and possibly the only path for technology deployment on a large scale” said Tilley. In the first of two talks on refractory recycling, Paul Glaubitz, General Manager Recycling, RHI Magnesita, the Netherlands presented “The driving force of recycling in the refractory industry”, covering refractory recycling today and tomorrow, examples from other industries, and examining what we need “to get there”. Glaubitz emphasised there needed to be a cultural change, a new mind set, and that recycling has to be considered from all stakeholders. In particular, online analysing methods, sorting, separation needed to be improved. 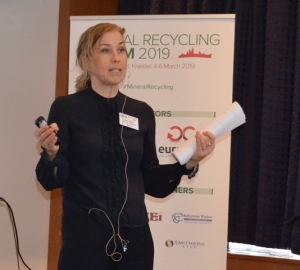 Glaubitz underlined how RHI Magnesita’s Roadmap 2019-2015 would encompass this new approach to recycling of “take all, use all” and overall enhance the recyclability of refractory products. Team RHI Magnesita, with speaker Paul Glaubitz, General Manager Recycling (centre) at Mineral Recycling Forum 2019. In “From best practices to excellence in refractory waste management”, David Maza, R&D – Process Manager, Sidenor, Spain, gave a very detailed and well illustrated examination of Sidenor’s integrated and systematic management of all the refractory waste at its Basauri plant, on which the company has been working for the last six years. Maza discussed the plant’s main refractory waste generation zones and showed examples of “pursuing the excellence” by obtaining higher value added products from isostatic tubes and tundish mixes in the tilting area. On 12 January 2019 Sidenor had funding approved for its E-CO-Ladle Brick European Research Project, which follows last year’s approval for funding its 5RRefrACT (LIFE proposal) project. 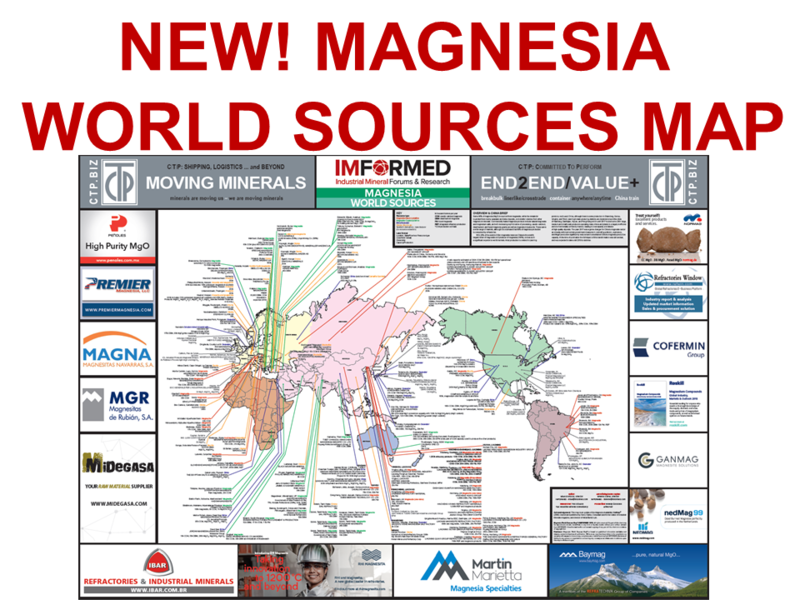 In the latter project, Spanish magnesia producer Magnesitas Navarras is to develop new added value magnesia basic products from recycled refractories. “Roller press briquetting and granulation to turn fines into valuable materials” by Patrick Lecherf, Export Manager, Euragglo, France, looked at the principles of briquetting and granulation using roller press technology. Lecherf illustrated the talk with examples of applications to reuse fines as secondary raw materials such as those sourced from by-products from the steel industry, refractory bricks, refractory clay, coal, and lime production. He also showed the range of vertical and horizontal feed presses developed by Euragglo. “Opportunities and challenges in the use of bauxite residue (red mud)” presented by George Banvolgyi, Technical Director, Bán-Völgy Ltd Partnership, Hungary (and co-authored with Ken Evans, Independent Consultant, UK) was a superb review of the state of play with regard to making use of the substantial volumes of red mud created through bauxite processing. Over 165m tpa of bauxite residue is being produced, adding to the 3.5bn tonnes already stockpiled to date: “An enormous deposit to mine as a future resource.” announced Banvolgyi. Banvolgyi in turn examined red mud generation, scale of the issue, current disposal methods, composition, uses, and challenges to increased use. 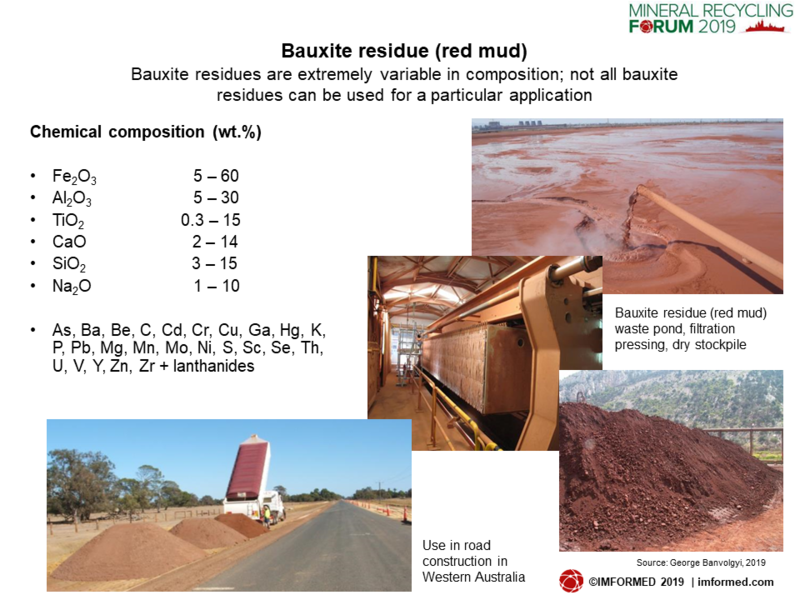 “Although a rich source of elements, bauxite residues are extremely variable in composition so one must be careful not to assume all bauxite residues can be used for a particular application.” cautioned Banvolgyi. Despite extensive and continuing research into red mud usage, only 4% is recycled and used at present, perhaps around 5m tpa used in cement, steelmaking, roads and construction, ceramics, and mineral wool. 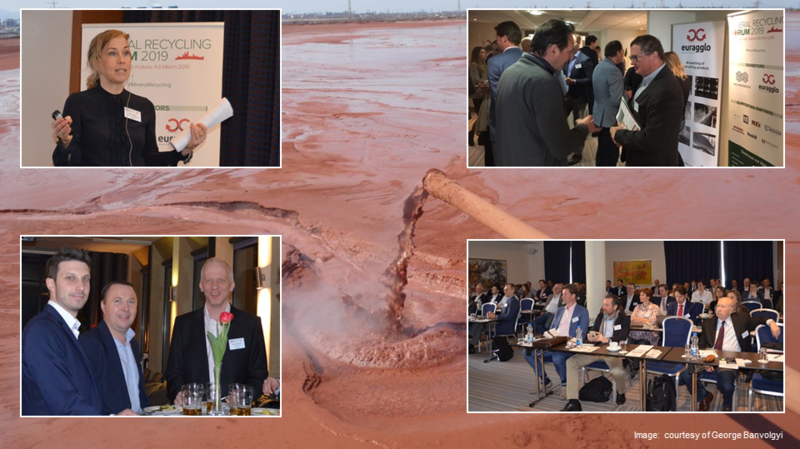 “So far no process has been a commercial success, because of specific problems associated with the bauxite residue such as low iron content, high alkali content, fineness of particles, and moisture.” said Banvolgyi. Increased use is expected in steel, cement, acid mine drainage, heat storage media, and flame retardants, and especially in China. 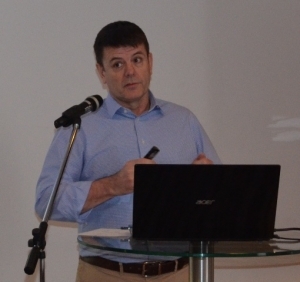 “Recycling of wastes from the mining, power and metallurgy industries” by Prof. Krzysztof Galos, Director, Mineral and Energy Economy Research Institute, Polish Academy of Sciences, Poland, was a comprehensive review of the main wastes of Poland and their level of recycling. The country’s total industrial waste generation was estimated at 113.8m tonnes in 2017, mainly from the hard coal, metal ore, industrial mineral and rock, chemical, metallurgical, power, and water and sewage sectors. Potential waste mineral raw materials are being sought from minerals mining and processing, inorganic chemical industry, power plants and central heating plants, steelworks, nonferrous metals smelters, ferroalloy smelters, foundries, glassworks, and ceramic plants. 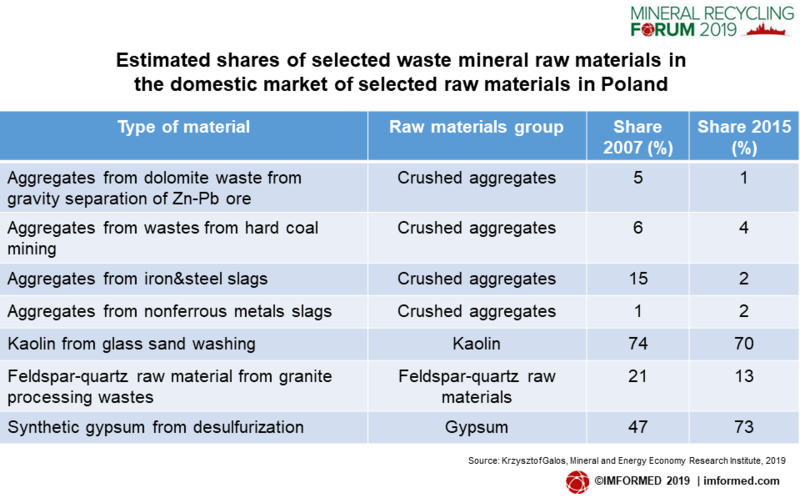 There is a range of waste mineral raw materials being used in Poland, such as full substitution of primary raw materials, eg. FGD gypsum, aggregates from metallurgical slag, aggregates from waste dolomite of Zn-Pb ore processing. There is also lower quality substitution of primary raw materials, eg. aggregates from hard coal mining wastes, kaolin from glass sand washing, fine-grained granite wastes. 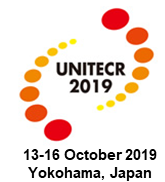 Juha Pinomaa, Chairman, Betolar Ltd, Finland presented “Opportunities in turning waste into geopolymer based construction materials” describing how research started in 2013 to find new sustainable materials for the construction industry with the focus on geopolymer research. The initial aim was to help Finnish pulp and paper companies reach a zero waste goal, and so far there has been excellent results with slag, and promising results with certain tailings. Betolar is licensing its technology in key markets, with recipe management and application specific production technology. Application examples include in mining using crushed geopolymer in the stabilisation of tailing dams and heap leach pads, and in construction base layers for roads and lightweight concrete blocks. “Recovery of magnesia and chromia from chemical waste” by Duane Runciman, Partner, Wastes Ecotech Srl (WET), Romania, reviewed in detail a fascinating multi-phase reclamation project to recover commodities from a former state owned fine chemical production site which operated from 1916-2006 (most recently producing dichromate) at Tarnaveni, Mures county, Romania. The target waste material amounts to 1.95m cubic metres, or 3.5m tonnes, of sodium dichromate waste tailings, containing magnesia, chromia, calcium chloride, and ammonia. In Phase 1 (Years 1-9) “mining” of the tailings resource (all above ground) is to be a simple form of exploitation using long reach excavators, wheeled loaders and low ground pressure dump trucks. A proposed WET process technology to reprocess the tailings eliminates current environmental concerns (regarding present Cr6+) while extracting the minerals as chrome oxide green, fused magnesia, calcium chloride and liquid ammonia (as a by-product). Phase 2 (Years 10-20) envisages to continue processing locally sourced micronised dolomite into the existing plant, post reprocessing to produce fused magnesia or magnesia. WET followed the JORC Reporting path to obtain a Certified JORC 2012 Report on the tailings based on Estimated Resource, Probable Reserve. An Inferred JORC was obtained in 2014 and current work is aimed at upgrading to Estimated for a Bankable Feasibility Study. There is strong local and federal government support for the project which is anticipated to provide direct and indirect employment for around 1,000 when in full operation. In “Trends & outlook for the ferrous and nonferrous slag markets”, Daniel Rogers, Head of Market Reports and Consultancy, Smithers Apex, UK, presented the supply and demand picture for ferrous and non-ferrous slags to 2029. Key trends in ferrous slag included more emphasis being placed on the sustainability of resource use. Increasing carbon prices are pushing up the value of granulated blast furnace slag. While marketwise the US and Middle East (UAE, Qatar, Oman, Egypt) show strong construction growth, with infrastructure projects growing in China and India. Rogers explained that the slag markets for non-ferrous products are derived sectors that have substantially different applications from steel slags, due to their varied properties. A number of non-ferrous slags have developed a high rate of resource reuse. Many initiatives are evident where smelter capacity is opening up across the globe. 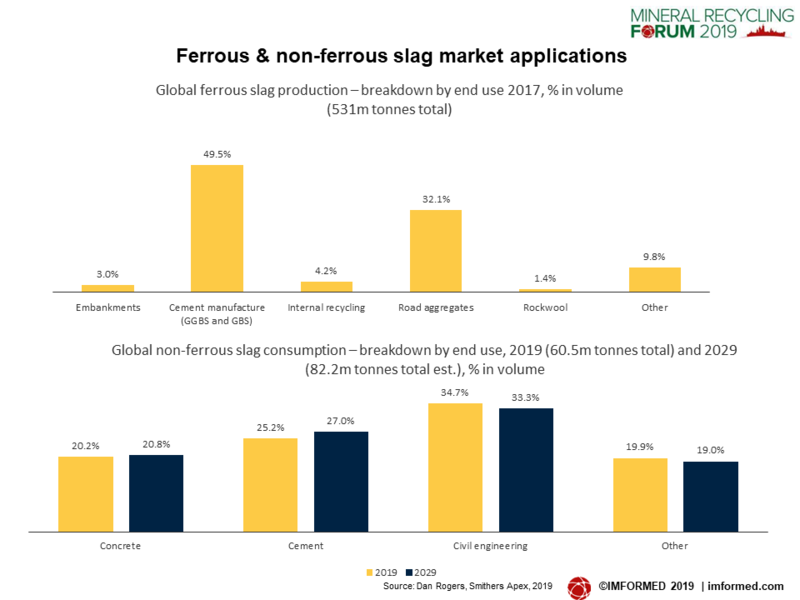 Overall, there are healthy construction markets driving ferrous and non-ferrous slag demand as environmental and related regulatory pressures are boosting use of ferrous (and a range of non-ferrous) slags. 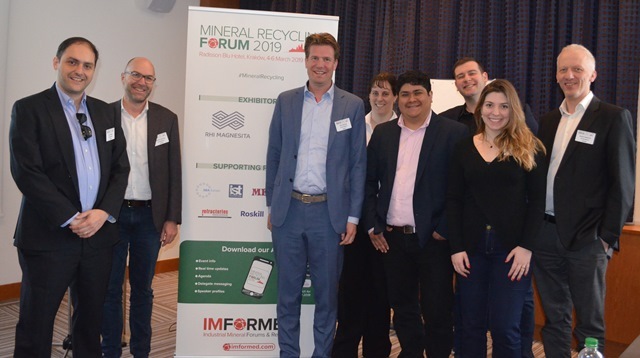 As ever we are indebted to the support and participation of all of our sponsors, exhibitors, speakers, and delegates for making Mineral Recycling Forum 2019 such a success.